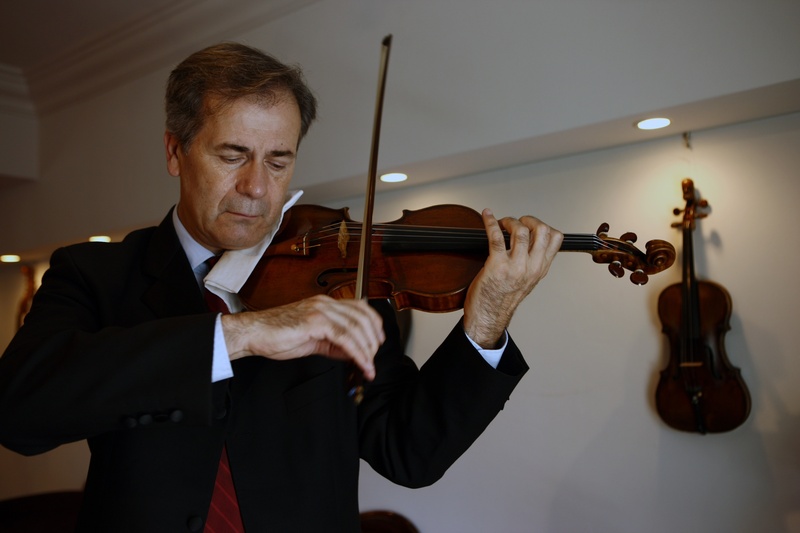 Goran Končar, one of the most prominent Croatian violinists, born 1954, studied at the Zagreb Music Academy in the classes of Martin Borić and Josip Klima. He achieved his M.A. degree in the class of Leonid Kogan at the Tchaikovsky Conservatory in Moscow. He continued his musical training with Max Rostal in Bern and Henryk Szeryng in Geneve. Then he continued studying under Yfrah Neaman in London to become his assistant at the Guildhall School of Music in the period 1981 – 1983. He started his international soloist career in 1982, undertaking guest tours in most European countries, the USA, Japan and Israel. In the period from 1984 to 1994 he was concert master of the Royal Philharmonic Orchestra in London, the Croatian Radio & Television Symphony Orchestra and the Zagreb Philharmonic. He also performed in many concerts with eminent orchestras and conductors throughout the world. Končar is the recipient of many first and special awards at numerous national competitions in the country, as well as the Music Life award in Moscow (1980) for the performance of the Concerto for the Violin and Orchestra by Dmitri Shostakovich, the first prize at the International Competition in Bratislava (1984) and other top acknowledgments. The long list of his awards includes the outstanding Vladimir Nazor Award (2006). Končar’s first disc was published in 1984 by EMI in London, and he has also recorded for the BBC, CBS, France Musique, HRT and other radio and television stations. Croatia Records published one of the rare integral performances of Eugène Ysaÿe’s solo violin sonatas. From 1987 to 2012 he directed the Zagreb Quartet and for the quarter of the century he embedded his skill and art into the existence of this oldest chamber ensemble, not only in Croatia but in Europe as well. The Zagreb Quartet was established as far back as 1919, and for the period of almost a century it was a basis of the tradition of chamber music-making in Croatia; in this tradition Goran Končar is certainly one of the pivotal personalities. During this period he appeared in more than 2,000 concerts, and under his guidance the Zagreb Quartet had more than 1,000 performances, appearing on all continents in best known world concert halls, and cooperated with a large number of Croatian and foreign soloists. Končar also played the majority of first performances of works composed by Croatian composers written for the strings quartet, and he also published 15 albums. What should not be forgotten is the fact that the Quartet had to find a solution for their working space as a crucial problem. In the year 2007, supported by the City of Zagreb, the Zagreb Quartet was granted their own studio in 31 Ilica Street. Under Končar’s guidance the Zagreb Quartet performed all quartets composed by Shostakovich, Mozart, Prokofiev, Janáček, the majority of Haydn’s quartets and all quintets.